This is a synopsis of his thread titled “HL45’s Harvest Large Herb Lounge.” You can view the entire thread by clicking here. In the first slider are some examples of his fine buds, and some shots of the grow rooms. This is the Snow Dawg. and I have been asked not to pass it out. Highly prized and rarely, if ever, shared. while the 1ks are only on for 12 hours a day. This is a 9k 16 plant room, just loaded with Snowdog, Barney's Farm LSD, Cinex, Dire Wolf, Strawberry Diesel, 9lb Hammer, and La Blanca. While HL45 is well known for his indoor, his outdoor efforts are equally awesome. But along the way one always has a few bugs outdoors, as you will see in this next slider. Beginning with a wall of buds to tantalize you! "All in all you're just another bud on the wall." Found some interesting eggs while cleaning up the smaller row of plants, my guess is cucumber beetles. Gooey growing outdoors... Barney's Farm LSD outdoors. Closeup of the Gooey outdoors. 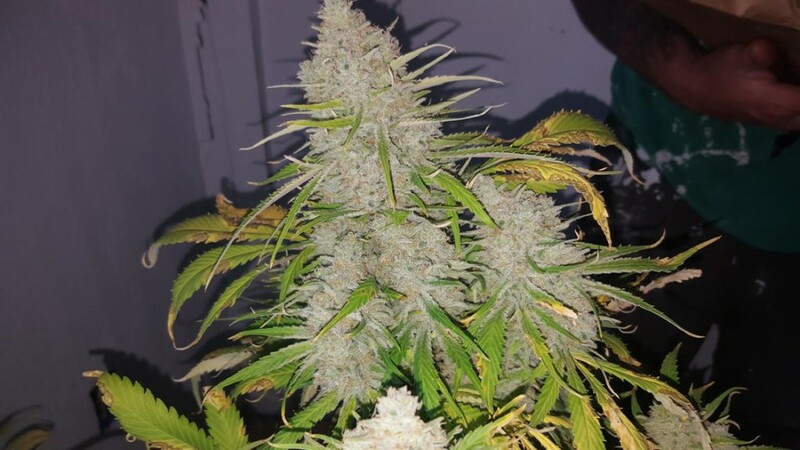 These monster buds are Snow Dawg growing indoors in organic soil. I’m still doing vert rooms and am about to build out a 10 light room soon. I’ve been playing with organic dirt again and enjoying it… My plate is full my days are long, my life is sweet. Click here to visit HL45’s profile page and visit his other threads and posts on the International Cannagraphic.